When Superior, Wisconsin’s Sts. Anthony and Margaret Catholic Church was established in 1914, it came as a welcome relief for the Catholic Belgians in the city’s Allouez neighborhood. Before that they were forced to attend mass two miles away at St. Francis Catholic Church in the East End—and getting there could be treacherous. Established in 1892, St. Francis didn’t have a church building of its own until 1908, and at the time there was no Catholic church in Allouez. The neighborhood, bounded on three sides by the Nemadji River, Bluff Creek and Allouez Bay, was home to a large number of Belgian immigrants employed at the Great Northern ore docks. Fr. Eustace Vollmer, of St. Francis traveled to Allouez twice monthly to offer mass to mostly Belgian Catholics, either in private homes or at the Modern Woodsman Hall at 3816 East 3rd Street. On alternating Sundays, the Allouez parishioners traveled to St. Francis. There was no convenient streetcar line, and none of these immigrant dock workers could afford a horse and carriage, let alone an automobile. At the time, the only passage out of Allouez crossed a narrow wooden bridge over Nemadji River, located about two blocks west of today’s Nemadji Bridge. A hardy bunch, the Belgians didn’t mind the distance of the walk as much as they did crossing the bridge. Snow and ice coated the timbers during the winter, and a stiff wind regularly blew through the bog it crossed, causing the bridge to sway. Luckily for Superior’s Belgians, in 1905 the Catholic Church established the Superior Diocese to serve northern Wisconsin, appointing Fr. Augustine Schinner bishop. Schinner died in 1913, and Joseph M. Koudelka took over. Koudelka immediately recognized the need for a church in Allouez. Key to the church’s success would be locating a priest that could not only speak Latin and English, but Flemish as well—for most parishioners, English was a second language. The church sent Fr. Rudolph Hanssens of Antwerp, Belgium, to preside over the first mass for the Allouez congregation in May of 1914. Hanssens wasted no time declaring his dream to build not only a church and rectory, but a school and convent as well—all of it surrounded by good Belgian households raising well-behaved children educated in the Catholic doctrine. Hannsens received help from Superior pioneer James Bardon, namesake of Bardon’s Peak and once editor and publisher of the Superior Times, who donated two blocks on East 43rd Street to the diocese for the site of the new church. In July 1914 Rene Lagae began construction of a 40 by 80-foot wood-frame building with a full basement and a steeply pitched gable roof featuring a central steeple—a fairly typical design for early twentieth century churches. During construction, the parish referred to the building simply as the “Allouez Church.” Hanssens believed he had the power to choose the name for his parish. But his fellow Franciscans, led by Fr. Vollmer of St. Francis, had their own thought on the matter. The church would be named after a Franciscan saint, but Hanssens and Vollmer could not agree on which saint. Vollmer wanted to dedicate the parish to St. Anthony of Padua. Hanssens had once promised that if he ever had the opportunity to build a new church, he would dedicate it to Saint Margaret of Cortona—a favorite of the Belgian people. It took months for the two clerics to reach a compromise—the new church would be named Sts. Anthony and Margaret. 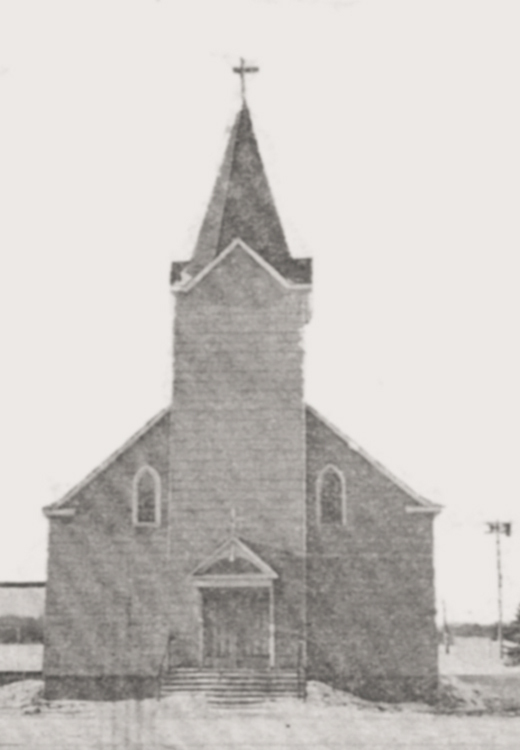 In 1959 a new church was built to replace the 1914 building. When the new church opened, it was named simply St. Anthony’s Catholic Church. St. Margaret, apparently, was not part of the new church—no reason for the name change has been found. At the time, some parishioners joked: Anthony and Margaret had been granted a divorce. Not all of their fellow parishioner, nor other members of the diocese, appreciated the humor. It has been 100 years since the Belgian Catholics of Allouez had to walk the two-mile trek to St. Francis, but its parishioners have not forgotten those early days. Each Easter Monday, members of the Belgian Club walk from their clubhouse on East Second Street to St. Anthony’s Church to celebrate a mass in memory of their departed brethren. In August of 1914, 39 Catholic families in Superior’s Allouez neighborhood, most of them Belgian, celebrated the founding of Sts. Anthony and Margaret Church. The long-awaited parish was the answer to their prayers. They wasted no time in creating a strong spiritual community centered in the church they built on 43rd Avenue East one block off East Second Street, under the guidance of Father Rudolph Hannsens. Congregants formed a choir as soon as the building was completed but, lacking an organ, they sang without accompaniment until 1916. Typical first observances are noted in the church’s records. On October 16, 1914, Joseph Maria, the infant son of Mr. and Mrs. Leon Jacques, was buried by the new church; Francis Joseph Janssens received the first rite of Baptism at Sts. Anthony and Margaret two days later. Twenty-nine young boys and girls completed their catechism in June of 1915, and on August 16 that same year, the church’s first wedding united Miss Mary Lydia Davidson and Hubert Van Grinsven —presumably they were able to enjoy organ music for their ceremony. About this same time additional lots on Baltic Street (now East Third Street) were donated to the parish by Emma Corrigan for a school site. The outbreak of the first world war would delay the school’s construction and opening for several more years, so youngsters attending Catholic school at St. Francis in Superior’s East End still had to walk or ride their bikes across the fourth street bridge to and from classes every day. Numerous ministries were established during the early years of the church. The ladies Altar Society formed in 1921, followed in 1924 by the Society of the Holy Name for the parish men—the first active Holy Name Society in the Diocese of Superior. In 1917, just three years after arriving from Antwerp, and before even laying the foundation of his rectory, Fr. Hanssen’s superiors called him back to Belgium. Following his departure the Superior Diocese announced that the new pastor of Sts. Anthony and Margaret would be one of their own priests, Fr. Francis Bertram. Fr. Bertram’s leadership skills moved the congregation toward more inclusivity and less nationalism. He successfully established new parish boundaries that included Catholics living east of Bluff Creek in the Itasca neighborhood. Swedish, German and Norwegian Catholics joined Sts. Anthony and Margaret parish, and although Fr. Hanssen’s did not realize his dream of a purely Belgian faith community, the church still held fast to its plans for a rectory and school. Fr. Bertram was assigned to St. Mary Church in Rhinelander within the year. His replacement, Fr. William Kubelbeck, served the parish from 1917 until his death in 1962. During his 44-year tenure with Sts. Anthony and Margaret, Fr. Kubelbeck became a Monsignor and also held the position of Chancellor of the Superior Diocese. Fr. Kubelbeck picked up where his predecessors left off. In January 1923, he implemented fundraising for the church expenses using the envelope system for donations made during Sunday mass. Funds quickly grew to $8,000, enough to build a permanent rectory by the end of the year. All that was left to complete the church’s plans was building its school. In the spring of 1925 the congregation had raised nearly half the amount needed to build the school—$20,000. In a unanimous vote they approved a total expenditure of $42,000, assuming a $22,000 debt. Plans drawn by John O. Back called for a three-story building accommodating six classrooms—two per floor. Jenson and Campbell Contractors built the church, and by the time it was complete Father Kubelbeck had secured the services of three Franciscan Sisters of Perpetual Adoration from the Lacrosse Diocese to teach in the new school. The top floor of classrooms were redesigned as living quarters and served as a convent for the nuns. The school opened on September 14, 1925, with 98 students enrolled in grades three through six. The official dedication by Bishop Joseph G. Pinten took place on October 25, 1925. The following year, four more grades were added, increasing the school’s enrollment to 152. Following World War II, the arrival of the Baby Boomers and a prosperous post-war economy caused such rapid growth of the parish that Fr. Kubelbeck required the services of an assistant priest. Realizing that the rectory needed substantial repairs and modernization if it were to accommodate additional priests, Fr. Kubelbeck asked for the congregation’s support in remodeling the entire building, inside and out, at the cost of $22,000. Improvements to the church’s interior and exterior were also made at this time. On April 11, 1951, Pope Pius XII named Fr. Kubelbeck a Right Reverend Monsignor. By this time Sts. Anthony and Margaret’s choir boasted 25 members. Additionally, the grade school choir performed the solemn duty of singing for funerals held in the church. Monsignor Kubelbeck believed that original church building had outgrown its parishioners and was outdated; he wanted a church the parish could be proud of and reflect the modern concepts of Catholic worship. In addition, the living arrangement for the sisters dissatisfied him—he felt the dedicated teachers deserved to reside somewhere separate from their daily labors. Construction of the new church with attached rectory began in September 1957 at the projected cost of $350,000. The building was dedicated on October 30, 1958. St. Margaret was dropped from the name and the new parish became known simply as St. Anthony’s. The former rectory became a convent, where the sisters lived for the next ten years. The new church had clean, modern lines and open spaces. Father William Wenniinger, chairman of the diocesan liturgical commission wrote, “Discerning visitors will be deeply impressed by the well-ordered simplicity and grave dignity of the church of St. Anthony. The church is clean and strong, expressing the spiritual strength and incorruptibility of God’s people; disguise, pretense and superficially have been strictly avoided. All this merits for this church the designation as good contemporary church architecture.” The new church building received an award as one of the ten best structures submitted in the Minnesota Society of Architects’ awards program the following year. A very distinct feature of Superior’s St. Anthony’s Church is the fourteen strip windows (seven on each side), which tower from the ground to the roof, accentuating the expansive brick walls. The windows are paneled in colored glass. Black silhouettes in each of the windows represent the fourteen Stations of the Cross. In 1968 St. Anthony’s school closed during the consolidation and relocation of all Catholic grade schools in the diocese to Cathedral School at Christ the King parish. The former school building is now an apartment complex. The convent was sold to Catholic Charities in 1969 and converted to a home for runaway girls. The entire basement, even the toilet seats in the bathroom, were painted in bright rainbows, suns and peace signs. The home was sold again in 1975 as a private residence. Today St. Anthony’s serves the needs of the Catholic faith community in Allouez under the guidance of Fr. Leon Flaherty. The small congregation still includes members of Belgian descent along with other families in the community. St. Anthony’s is probably best known to non-members for their annual fish fries held every Friday night during lent—a popular fundraiser for the church.